In this article i will show you that how you can save router configuration to text file or restore router configuration from a text file from your PC to your real router or on a GNS3-router. I am showing this simulation on GNS3 for this purpose we required TFTP Server. TFTP server installation and configuration are very simple and easy, install it from its setup.exe and in configuration of TFTP server you need to define it's IP address and file-path of TFTP-server. 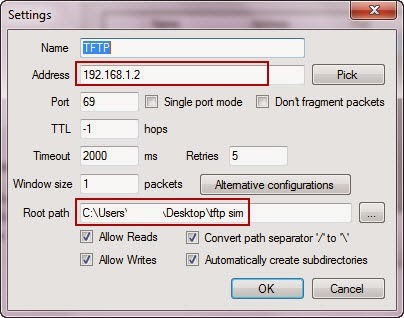 Path of TFTP server is the default location where you can save and load the configuration file to router. You can review my TFTP configurations, 192.168.1.2 is IP of my PC. For GNS3 simulation i used a "cloud" for connecting tftp-server to GNS3 router, i just mapped the physical network interface with cloud from its configuration and assign the IP address to router interface from same IP-range i.e. 192.168.1.112.
where 192.168.1.2 is address of tftp-server, "router-config" is text configuration file which you want to import on gns3 router.